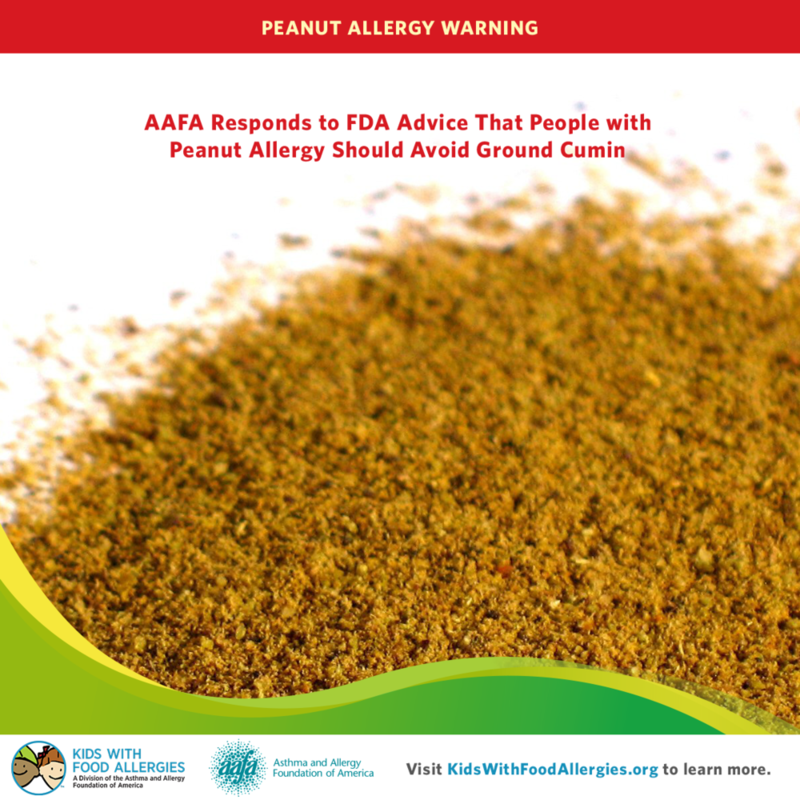 This week, the Food and Drug Administration issued a warning to people with peanut allergies, advising them to consider staying away from all food products containing ground cumin or cumin powder after a wave of recalls. Ground cumin, apparently from overseas suppliers, has been found to contain trace amounts of peanuts. The recalls began in late 2014, and the FDA issued the wider warning on Wednesday, February 18, 2015. “Cumin is very commonly added to foods. We understand how frustrating and upsetting this contamination is for families dealing with peanut allergies,” said Dr. Cary Sennett, President and CEO of the Asthma and Allergy Foundation of America (AAFA). AAFA is the nation’s oldest organization dedicated to improving the lives of people with asthma and allergy. Its Kids With Food Allergies (KFA) division provides timely information to consumers about food allergy management and treatment, including specific information about food safety and product recalls. "Exposure to even a trace amount of peanut can be life-threatening for those who are allergic. This is just another reminder of the challenges that so many Americans face, keeping themselves and their food-allergic children safe from accidental exposure,” said Dr. Sennett. Remember: Cumin may not be specifically mentioned on the label of food products that contain it. Under the Food Allergen Labeling and Consumer Protection Act, there is no requirement that it be specifically identified by its name. If you have recently purchased a product containing “spices,” call the manufacturer to see if it contains ground cumin. Understand the signs of anaphylaxis and know how to treat a reaction. If you eat in a restaurant, follow your usual safety plan.Carry two epinephrine auto-injectors. Ask to speak to the manager before ordering. "AAFA is committed to bringing the concerns of the food allergy community to the FDA,” said Dr. Sennett. “We worry about any possible risk that may exist in consuming these products and we urge everyone to proceed with an extra measure of caution." For more information, visit www.aafa.org or www.kidswithfoodallergies.org.